If you are a visitor to the tropically warm state of Florida, plan a unique ghost-hunting adventure and stay at one of Florida's historic haunted hotels. And if you are a resident of Florida , get to know your state's spookier side and embark on an exploration of the unexplainable and visit one of Florida's very own haunted hotels. 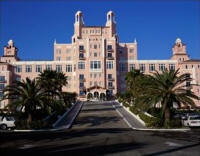 One of its most haunted hotel is the historic Don Cesar Resort, affectionately known as the Pink Palace. The Casablanca Inn, a beautiful Mediterranean-styled bed & breakfast offering sprawling verandas and bay front views, is also home to the Lady with the Lantern legend. 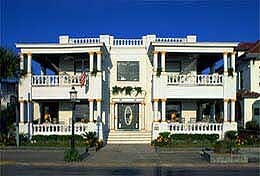 In the 1920s, then known as the Matanzas hotel, the Casablanca Inn was a hotbed for smuggling alcohol into the U.S. during times of Prohibition. The proprietor of the hotel, a widow who laughed in the face of Prohibition, allowed rumrunners to set up shop at her place and sold liquor to the guests and locals who were familiar with the operation. The rumrunners would stay there for a few days at a time, then move along by sea to their next setup. She soon fell in love with one of the smugglers. However, the G-men were after the rumrunners. Desperate to help, she would climb the roof of the hotel with a lantern in hand and wave it to signal the rumrunners offshore whether it was safe or not to come ashore. Eventually, prohibition ended, and the widow ended up making good money from her smuggling ways. The Don Cesar, affectionately known as the “Pink Palace”, is a long-time “resident” of western Florida. Located near St. Petersburg and Tampa, you cannot possibly miss The Don Cesar because of its striking pink color. Thomas Rowe started its construction in 1925 and the Don Cesar was completed by 1928. It was first called the “pink lady” and it entertained such high profile people as F. Scott Fitzgerald, Clarence Darrow, Babe Ruth and the rest of the New York Yankees during spring training. The Don Cesar also is now known to entertain some ghosts. The Don’s legendary ghost story involves its original owner and builder, Thomas Rowe (left). While overseas as a student in the 1890’s, he met a woman by the name of Lucinda, a Spanish opera singer. They fell in love, however her parents did not approve of their relationship. A heart-broken Rowe returned to America, but never forgot Lucinda. He wrote her letters, but they were returned unopened. After she died, Rowe had received a letter written by her telling him she never forgot him. To commemorate their love, Rowe included a replica of the fountain where he and Lucinda used to meet. After Rowe died, the hotel suffered and came to an end. It became a VA hospital and a government building until its restoration and comeback in 1973. The hauntings happen to begin around 1973. Although this fountain had been removed, construction workers, and later employees at the Don Cesar reported seeing a man in a Panama hat walking with a woman hand in hand in the lobby (right) and garden. And as soon as they appear, they disappear. Some also see Rowe on the fifth floor where he used to live. Some also believe that other ghosts live at “The Don.” These ghosts are thought to have stayed around during The Don’s time as a VA hospital. 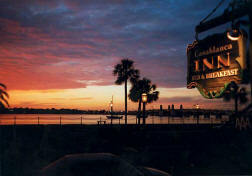 Today, many baseball teams stay there while playing the Florida Marlins. It is joked that players would “spook” rookies while staying at the Don Cesar because it is such a widely known haunted hotel. Besides enjoying the warm, tropical climate and easy-breezy attitude of Key West, yes you can even enjoy a haunted spirit as part of your itinerary. 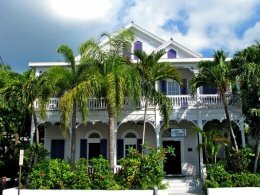 Marrero’s Guest Mansion, a beautiful b & b located only half a block away from world famous Duval Street is known for its true island hospitality. It is also known for its spirit named Enriquetta who to this day, still lays claim to “her” home. 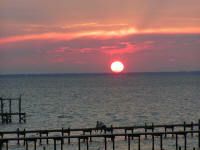 In 1889 Francisco Marrero, a prominent cigar maker built the mansion in order to lure his love, Enriquetta to Key West. It worked! They married and eventually had eight children all living happily in the beautiful Marrero mansion. As many love stories turn tragic, apparently during one of Francisco’s business trips to Cuba, he died under suspicious circumstances. But the tragedy for Enriquetta continues. Unbeknownst to Enriquetta, Francisco already had a wife in Cuba that he never divorced. After Francisco’s death, his first wife Maria came to lay claim to the mansion and won. Poor Enriquetta and her children had to leave the beautiful home they loved. But when she left, apparently she promised that her spirit would always remain in the home she loved. But rest assured, Enriquetta is considered a very benevolent spirit only roaming the mansion to keep an eye out on her old home. Enough of the history, let’s get down to the nitty gritty. Apparently Enriquetta has made her presence known much through the years. For instance, owner and innkeeper John Diebold has said that guests staying in rooms 17 and 23 have reported hearing the sound of babies crying at night. Not unusual at a lodge, not until you hear that Marrero’s is an adults-only establishment! As well, the neighbors next door have no children either. Interestingly, the rooms in which the sounds occurred were once the Marrero children’s nursery. Enriquetta has also been seen passing through the doors into the children’s old room. Guests have also reported seeing the spirit of Enriquetta in what was once her bedroom—room 18. She has been seen passing through the door that connected her room to the nursery. 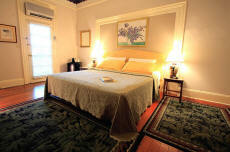 A traveler from tripadvisor reported the scent of lavender while staying in Enriquetta’s room, room 18. However, the potpourri in the room was not lavender-scented. The scent of lavender was smelled at various times in the room throughout their stay.